Very selective granular aquatic herbicide. Controls Eurasian watermilfoil. 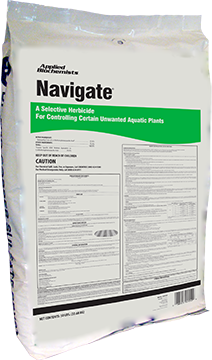 Navigate® aquatic herbicide is a very selective granular product great for milfol control, and is also an effective Water Lily and Watershield killer. For a more complete solution, we recommend using Liquid 2,4-D (same active ingredient)or additional dock and swim area products. Using Liquid 2, 4-D vs. a competitors granular pellets, you can treat the same area for up to 85% savings. Spread evenly throughout treatment area. Weeds need to be present. When applying Navigate® aquatic herbicide, we recommend using a Broadcasting Spreader. Selective Herbicide is formulated to control water milfoil, water stargrass, bladderwort, white and yellow water lily, water shield, water chestnut, and coontail. Water use is restricted for non-turf irrigation and drinking (human consumption), see label for details. Active ingredient is 27.6% butoxyethyl ester of 2,4-Dichlorophenoxyacetic acid. Application rate varies by target plant, density, and water depth. See label for details. Read all product labels for complete instructions before applying product. The granular pellets are easy to apply from the dock with a broadcast spreader. We have thick milfoil and watershield. This works great on both. We apply early summer and early fall. What's nice is it sinks to the bottom and works at the roots of the watershield before it reaches the surface. The granular pellets are easy to apply from the dock with a broadcast spreader. Thick milfoil and watershield. This works great on both. We apply early summer and early fall. What's nice is it sinks to the bottom and works at the roots of the watershield before it reaches the surface.